What is a Drawback Lock? 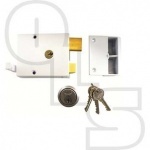 Drawback locks are nightlatches which feature a latch and a deadbolt. The latch is withdrawn by key from the outside and handle from the inside. The deadbolt is withdrawn by key from both sides. DID YOU KNOW? You can use our Filter Results tool to search for all Drawback Locks with a particular measurement or feature. Simply enter your parameters in the Filter Results tool at the bottom of the page.